The energetic, abstract and often sculptural paintings and collage of Jiang reveal the work of a dynamic and talented artist. Utilizing the abstract stylings of modern western painting tradition and incorporating traditional Chinese elements, such as joss paper, Jiang seamlessly synthesizes two world cultures. Born in the Jilin province of Inner Mongolia, the youngest child in what would prove to be an artistically accomplished family, Jiang exhibited considerable talent early on. With the assistance and informal tutoring of his talented older sister, Don Xin, and older brother, Hong, Jiang developed and honed his artistic talents. This training proved useful in trade school and Jiang, after graduation, found work as a welder, quickly rising to the rank of manager overseeing nearly 100 employees. 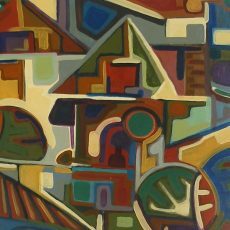 Still, Jiang did not forego his creative imagination; he continued to create exquisite and sophisticated paintings and unique sculptural pieces throughout his years working in the factory. 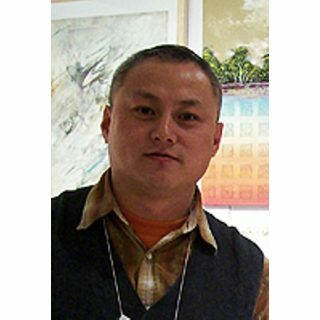 In 1989, at the encouragement of Slaymaker Fine Art, Jiang, soon to be followed by his brother Hong, relocated to the United States to pursue his dream as a professional artist. Jiang's experience and training as a tradesman has had a major impact on his paintings, both on paper and canvas. Jiang utilizes a variety of construction materials--modeling paste, resins and epoxies--to create highly sculptural paintings and collage. This very modernistic painting technique is, however, counterbalanced by Jiang's insistence on continuing the ancient tradition of mixing his own paints using raw pigments. "It's labor-intensive," admits Jiang. "But I find it necessary for the overall process." He adds,"You must know your materials; it's no different than making glazes for ceramics. There is no better way to know paint then by mixing the pigments yourself."